Viewing topic "failure to launch cubase"
I can’t launch Cubase anymore. I’m getting messages like: register if you want to continue using the program. Sometimes it says the eSOFT. licenser doesn’t have enough permission.... I have no clue what’s going on! anyone help! For any further help you need to provide what Cubase version you are talking about. the guys from Steinburg Germany sent me an email and guided me thru how to register and download using the LCC. All went fine. I tried launching the Cubase again, didn’t work. same message Register now. I do click on it, nothing happens. Now what! I was finally able to register and launch cubase again. I noticed while recording audio that there are sporadic clips that occur no matter how low the gain. is that because it’s a free copy so they can’t let you do anything decent with it or what? Your clips are more likely to do with your soundcard or your system than Cubase itself. Note if you are using the freebie version of Cubase that came with your XS then you are using Cubase AI. It woudl be difficult for us to offer much more in the way of help without you giving some more info about your system and set up. thanks for your replies and helps, especiallly the guys at Steinberg. I’d love to update, but if it involves moneys, I might not be ready to spend anymore money right now. if you know How i can update to some later version for free, please help. Otherwise I’d like to use this free verion until I am familiar with cubase and ready to include a full blown system in my studio. I looks like I do like the cubase concept. I think I do. Ok to get back to my previous issue, I’ll see if I can provide you with as much info as I could, hopefully i’ll be able to help you help me. De Uno I’m using PC Windows XP sp2 pentium4, lots of Ram. What Soundcard do you use for Cubase AI4 at the moment? The Motif ? I hope you guys can help me answer what card Im using between Motif XS and Cubase. Well, right now I’m at the point where, I’m able to launch Cubase with no problem. I am following closely the tutorials by Mr. BadMister on various ways to work and connect thru Mlan. the progress is pretty encouraging. the only drawback right now is these clips I keep getting and they are not pleasant. They rub out all my joy of cubase and I don’t like it even a bit! If this could help, let me tell you simply that, it’s almost as if i could hear every single click of the mouse I make. I have a loop i just recorded playing. I click on the transport option on the task bar, and I hear my click in a very distorted and scattered pieces of noises, aweful. doesn’t even sound like a real mouse click. but I only hear it when I click on something while something else is running within cubase. I also heard it when I tried to record something directly in cubase by playing the piano on the XS. I can understand why it could be an issue related to a sound card, but I just can’t pin point it. Everything else is working fine don’t take me wrong. the only other issue is, following the tutorial by badmister, there is a place where it says” now if you play/stop cubase motif xs follows these moves. didn’t do it for me. i am sure I followed all the directions and settings… don’t know what I missed. the test I tried to record, I had to manually and separately start cubase and Motif xs. that’s about all I can say right now. I have more gears in my studio, but for the sake of this testing i actually removed proTools from the equation and all the rest of them...just the XS and my computer running cubase. ----Go here to download a free update for Cubase AI. Make sure you download and use the full update and not the patch. During launch cubase asked if I want to use AsioMlan As the Audio master, i said Yes to that. Should that also be the Sound card? Or is there another. hey franks, did you have a chance to listen to the file I uploaded? Maybe not because I couldn’t myself. but the guy in UK was able to hear it cause i sent him as an iPhone file and I could listen to it on my iPhone too. Do you have an e-mail where I can send you the short file, so you can listen to it? unfortunatly we do not have a Motif to test here. Have you already ask Yamaha? There you find the “Processor scheduling” options, set it to “Background services”. Okay then, “mLAN” is your audio interface, and so in AI you should be using the mLAN ASIO driver. Your current problems are related to your audio device. Not sure what buffer setting you are using in your ASIO Control Panel, but you could try increasing that setting for a start. Sounds to me that you have your MIDI ports all criss-crossed some how, if mouse clicks are audible when you click in Cubase, it is highly likely that you have things routed wrong. Let’s deal with that before we get to anything to do with your computer and service pack issues. In Cubase (which is where, by the way, you will be making all settings for Cubase. Please forget about Windows and SOUND and AUDIO DEVICES and all of that for now. I am unable to get your MP3 of the noise you are hearing (the Motifator 3.0 work going on in the background is making attachments do crazy things now). 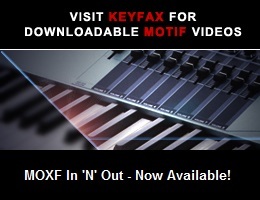 Make sure only the “mLAN MIDI IN” - “Motif XS” is marked in the “IN ALL INPUTS” column. This is very important. ok man thanks you’ve been a great help! Because of you now I have the current cubase version. It means a lot to me. I’m going to continue reading on the tutorials by badMister. and I’m going to stick around for The Good BadMister himself to show up. My inability to work freely with cubase gives me the impression that it isn’t a solid platform. I have to stop and take a deep breath before I continue. That’s not confidence at all..But I do believe it is more my inability than it is the solidity of cubase. For if people as experienced as BadMister and yourself trust it, I should too and be hopeful that I will figure it out and make music with it. well, can’t say thanks enough. hey badMister, I think your post and my last one were almost concomitant. That explains why I was still addressing Mr. Frank. I am attached to all these pseudos, if you will. I know it’s confusing but if you could bear with me on that appellation issue i’d appreciate it..
Ok, having set that aside, let me say that I am runnig service pack 3 now. I took a offer by windows a while ago to go from svcepack2 to 3. My mistake! I know I mentioned svce pack 2 in an earlier post. Mr. Frank’s persistence of getting the right details out of me made me go back and check to realize that I was running sp3. I didn’t think it mattered though. Yes! no kidding, I click on Transport over the top on task bar or another option, and I hear this indiscernible click simulation. But it sounds like something that should go away eventually, i was hoping so. Howerver i just updated to a current version, and it’s still there. if only you could hear it,that’s why I uploaded that piece of music. Too bad you couldn’t hear it. ok there you go! noise still there, i have yet to be inspired as to where it’s coming from. at least I can be humorous about it. i’ll continue to delve into cubase’s different controls and functions to become even more familier with it, as I wait for your help. When you took advantage of Windows SP2 to SP3 update, did you also take advantage of the update on the Windows bug that resets your Firewire bus to 100S instead of 400S? You will need to go to the following Microsoft support site, register and they will email you a link to download the fix (don’t ask me why they are doing this) all systems that use the firewire bus have this same issue. This has nothing to do with your mouse click “noise” - I don’t know what that is or if it is even related at all to Cubase, mLAN or anything. I would suggest you select one of the onboard ASIO drivers to test and see if this changes the results of clicking with the mouse.